You can mount a floral piece on top of a headstone in a gravestone saddle. The saddle is appropriate for a burial service at the cemetery. The stone topper is good for a memorial floral piece that can be made with fresh or silk flowers. Saddles are aluminum or heavy plastic units that have legs that drape over the sides of the stone holding the floral arrangement in place. 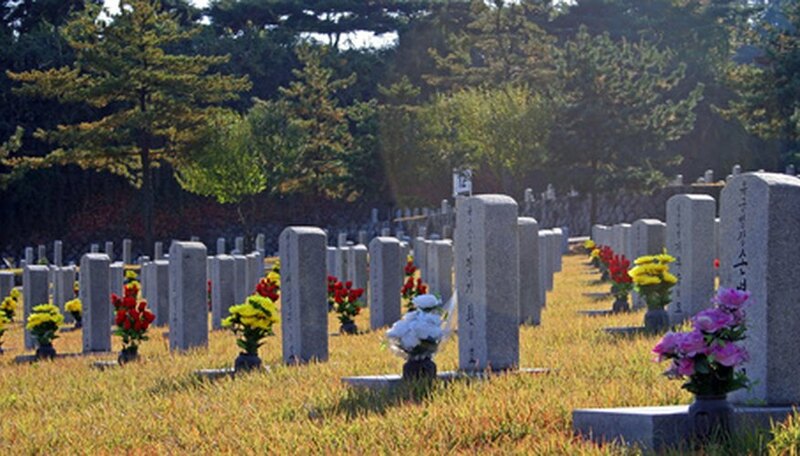 People can see the multi-colored flowers from a distance in the cemetery and leave more space for plants and floral pieces on the grave. Soak floral foam for fresh flowers in a bucket of water until it is saturated. This can take at least 30 minutes. If using silk flowers move on to Step 2. Place one or two pieces of wet or dry floral foam into the rectangular center of the gravestone saddle. Secure it by wrapping floral tape around the center and ends of the foam and adhere it to the saddle sides. Cut two line flowers such as a snapdragon, daisy stalk, gladiolus or stock stems on a slant to a 12-inch length. Insert the line flowers one on each end of the foam block. These two stems will extend out over the top of the headstone. Cut the remaining line flowers at 6 to 10 inches and insert them into the sides of the foam in the monument saddle. Cut leather leaf, cedar, fir, pine or asparagus fern and insert pieces around the bottom of the foam to cover any of the exposed gravestone or monument saddle. Cut two mass flowers including carnations, roses, iris, small hydrangea blossoms, lilac or lilies at 5- to 8-inch lengths. Insert a flower at each end just above where the first glads were placed. Add four to six blossoms at the top creating a subtle curving mound or triangular shape of flowers. Add filler flowers of babies breath, statice, asters or German statice to fill in any spaces. Add a satin or velvet ribbon bow to the bottom front or top center of the floral piece. The side pieces of the gravestone saddle will clamp onto the sides of the stone or monument to keep the floral piece secured in place.